The Insight launch earlier this month had a couple stowaways: a pair of tiny CubeSats that are already the farthest such tiny satellites have ever been from Earth by a long shot. And one of them got a chance to snap a picture of their home planet as an homage to the Voyager mission’s famous “Pale Blue Dot.” It’s hardly as amazing a shot as the original but it’s still cool. The CubeSats, named MarCO-A and B, are an experiment to test the suitability of pint-size craft for exploration of the solar system; previously they have only ever been deployed into orbit. That changed on May 5, when the Insight mission took off, with the MarCO twins detaching on a similar trajectory to the geology-focused Mars lander. It wasn’t long before they went farther than any CubeSat has gone before. A few days after launch MarCO-A and B were about a million kilometers (621,371 miles) from Earth, and it was time to unfold its high-gain antenna. A fisheye camera attached to the chassis had an eye on the process and took a picture to send back home and inform mission control that all was well. So far it’s only good news and validation of the idea that cheap CubeSats could potentially be launched by the dozen to undertake minor science missions at a fraction of the cost of something like Insight. Don’t expect any more snapshots from these guys, though. A JPL representative told me that the cameras were really only included to make sure the antenna deployed properly. Really any pictures of Mars or other planets probably wouldn’t be worth looking at twice — these are utility cameras with fisheye lenses, not the special instruments that orbiters use to get those great planetary shots. 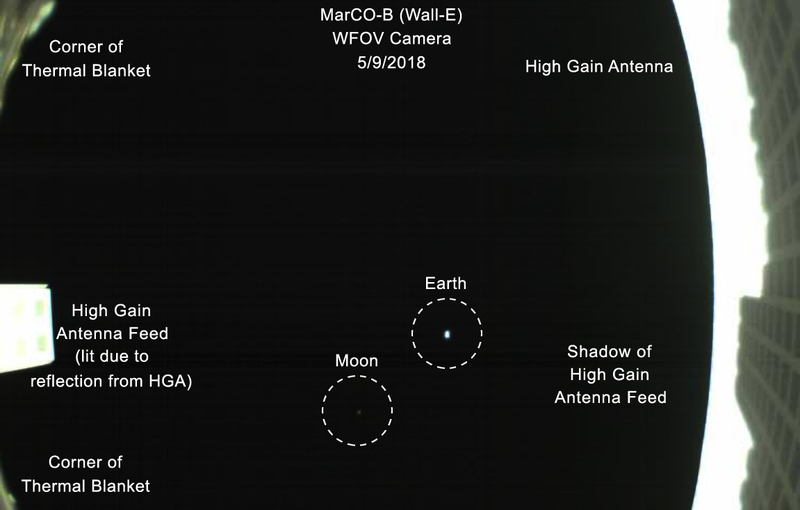 The MarCOs will pass by Mars at the same time that Insight is making its landing, and depending on how things go, they may even be able to pass on a little useful info to mission control while it happens. Tune in on November 26 for that!